This semester has turned out to be a lot busier than I expected. Teaching, omg, takes a lot of time. At least, I've been putting a lot of time into it, developing the lectures, writing out my notes in a coherent format, developing the problem sets, refreshing my own understanding of technical topics, translating research-y material into a more instructional level, grading problem sets, meeting with students, etc. etc. etc. This is, after all, what I signed up for as a professor. I'm also happy to say that I'm enjoying it a great deal. The students are engaging, ask interesting questions, and have already taught me new things. I do wish I had more time for research, but I suppose that almost goes without saying. One topic I expect to continue to struggle with is deciding how much material to cover and how deeply to go into it. Striking a good balance, making assignments and lectures challenging and interesting but not unreasonable or trivial, seems like an art. A good friend of mine warned me months ago that I should not underestimate how enormous a burden it would be to be completely and wholly responsible for an entire semester's material. I don't think I did underestimate it, but for sure I didn't understand, viscerally, what he meant until now. For those of you interested in the course, here's a current list of my lecture notes and the topics I've covered. I'll update this entry with the rest of the lectures, once they're up on the course webpage. 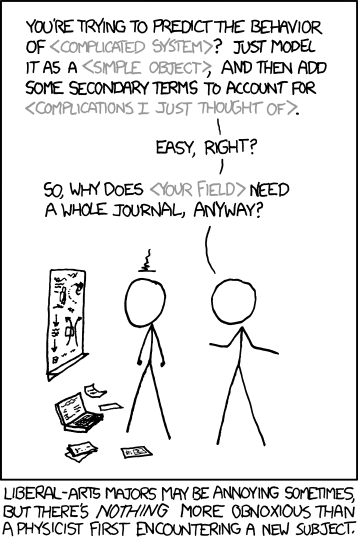 Update 16 Sept. 2010: Here's another great xkcd comic, on physics and other fields. Mason Porter, after a little nudging from some of us before the morning sessions of the SAMSI Complex Networks Program Opening Workshop and to satisfy what I'm sure will be a strong market demand, has set up The Power Law Shop at CafePress for all your power-law swag-related needs. Mugs, t-shirts, wall clocks, etc. Alas, no power-law plush toys, yet. Look for me soon in Boulder drinking my coffee from a mug that advertises "I went to a physics conference and all I got was a lousy power law." See Cosma for some additional commentary on the new shop.